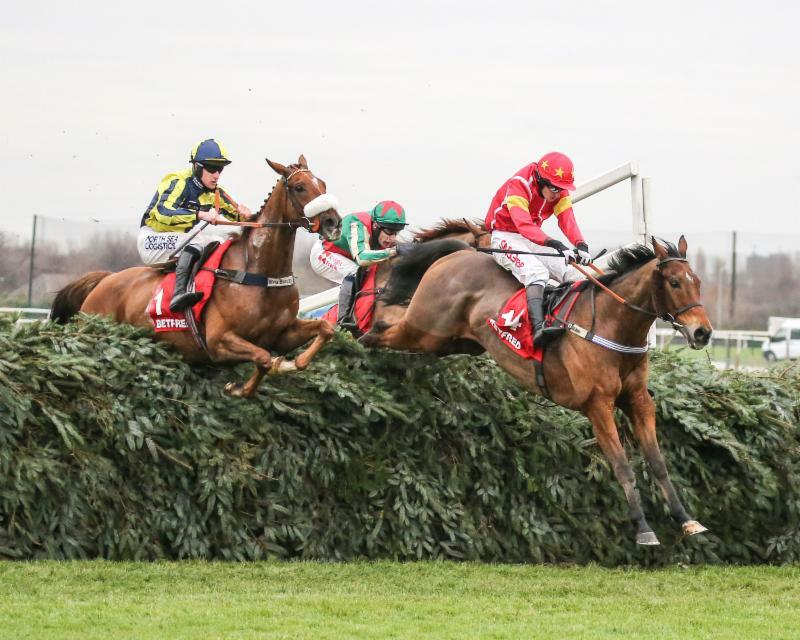 Last year’s winner Vieux Lion Rouge is among 24 five-day confirmations for the £145,000 G3 Randox Health Becher Chase (1.30pm), one of two races over the famous Grand National fences at Aintree on Becher Chase Day, Saturday, December 9. Vieux Lion Rouge (David Pipe, 11st 5lb) stayed on gamely to win last year’s running of the three and a quarter mile handicap chase, defeating 2015 scorer Highland Lodge(Jimmy Moffatt, 10st 5lb) by a short-head in a thrilling finish. Vieux Lion Rouge, who also captured last season’s G3 Grand National Trial at Haydock Park before finishing sixth in the Randox Health Grand National, is bidding to become the third dual winner of the Randox Health Becher Chase, following on from Into The Red (1994 & 1996) and Hello Bud (2010 & 2012). The eight-year-old was fourth on his reappearance behind Bristol De Mai in the G2 Charlie Hall Chase at Wetherby on November 4. Pipe said: “Vieux Lion Rouge ran well at Wetherby and has improved for that run. Blaklion looks the one to beat and it’s a case of the softer the ground, the better for Vieux Lion Rouge. “Touch wood, he jumps the Grand National fences better than park fences and I think we go to Aintree on Saturday with a good chance. Randox Health Grand National fourth Blaklion (11st 6lb) is clear favourite with bookmakers following an excellent second to stablemate Bristol De Mai in the G2 Charlie Hall Chase. His trainer Nigel Twiston-Davies has won the race a record five times. Somerset handler Paul Nicholls has two entries going forward, headed by last year’s impressive Grand Sefton Handicap Chase victor As De Mee (11st 2lb). Scottish Grand National hero Vicente (11st 4lb) is also engaged, although he could contest the G2 188bet.co.uk Many Clouds Chase (2.35pm) over the Mildmay Course. Nicholls said: “As De Mee goes in the Randox Health Becher Chase. I have left him in the Grand Sefton as well, just in case the ground gets very testing, but I intend to run him in the longer race. “He has run three times over the Grand National fences, winning the Grand Sefton last year, but I am confident that he will stay the Becher Chase trip. “He won over three and a quarter miles at Kelso earlier this season and I have been pleased with him. He loves the fences and the Becher looks the right race for him. The weights are headed by The Last Samuri (Kim Bailey, 11st 12lb), who was runner-up in the 2016 Grand National and third in this race last year. Several others who completed in this year’s Randox Health Grand National also remain engaged - Gas Line Boy (fifth, Ian Williams, 10st 9lb), Lord Windermere (seventh, Jim Culloty IRE, 10st 11lb) and Goodtoknow (13th, Kerry Lee, 10st 9lb). 2014 Cheltenham Gold Cup hero Lord Windermere is one of five Irish-trained entries. The Irish quintet is completed by 2016 Irish Grand National victor Rogue Angel(Mouse Morris IRE, 10st 2lb), progressive eight-year-old Westerner Point (Eoghan O’Grady IRE, 10st 1lb), Portrait King (Patrick Griffin IRE, 9st 11lb) and Dare To Endeavour (Eric McNamara IRE, 9st 4lb). Paul Nicholls and David Pipe will also be represented in the other race over the Grand National fences on December 9, the £70,000 188bet.co.uk Grand Sefton Handicap (3.10pm, 22 confirmations) over two miles and five furlongs. Nicholls is responsible for ante-post favourite Sametegal (11st 5lb), who returned from a 20-month absence last time out with an encouraging to second to Guitar Pete in a Listed handicap chase at Wetherby on November 3. The trainer said: “Sametegal missed a lot of time but ran a very good race on his reappearance at Wetherby. Pipe’s contender Rathlin Rose (10st 7lb) will also be making his debut over the Grand National fences. He was last seen out finishing third in Southern National Handicap Chase at Fontwell Park on November 19. Pipe said: “Rathlin Rose could run well with his low weight. He won the two military races at Sandown last season for Guy Disney and the softer the ground, the better for him as Saturday’s trip might be a bit on the short side. Other eye-catching contenders include the Simon Munir and Isaac Souede-owned pair of Polidam (Willie Mullins IRE, 10st 13lb) and Ballybolley (Nigel Twiston-Davies, 11st 11lb), plus Randox Health Topham Chase victor Ultragold (Colin Tizzard, 11st 2lb). There was two millimetres of rain on Saturday. The forecast is for settled and mild conditions up to the middle of the week, with wet and windy conditions following on Thursday. Colder temperatures are predicted into the weekend. In a new initiative for Becher Chase Day, British Horseracing Authority Jockey Coach and former jockey Brian Harding will walk the Grand National course with jockeys before racing. This is a continuation of what was done on each day of the Randox Health Grand National Festival in April. The walk before racing is voluntary, but has had excellent feedback from jockeys who have participated. Tickets and hospitality for Becher Chase Day are available to purchase at www.aintree.thejockeyclub.co.uk or by calling 0344 579 3001. If you are 18-24, you can go FREE to this fixture by signing up and purchasing a RacePass ticket online at www.racepass18to24.co.uk .